Often we think of swashbucklers as men, but a few brave women walked among the male pirates. One of them was Mary Read – a legend among pirate enthusiasts, but someone not widely known by the general public. Her extraordinary story has captivated men and women alike hundreds of years after her pirating exploits began. Read’s mother disguised her daughter as a boy to continue receiving financial support from her paternal grandmother. Young Mary began to find work as a boy, and eventually enlisted in the British military. She married a Flemish soldier, but his early death forced Mary back into her male disguise. After a short stint with the military in Holland, she boarded a ship heading to the West Indies. Fatefully, her ship was captured by pirates and she ultimately met with “Calico Jack” Rackham and the other famous female pirate, Anne Bonny. At first, no one knew that either Bonny or Read were women (including each other), but eventually they confessed to each other and to Rackham – who broke with seafaring tradition and allowed the women to continue pirating. Read’s exploits have inspired many young women to dream of their own swashbuckling adventures. Now you can dress as the infamous lady pirate with our Mary Read pirate costumes. Choose from our shirt, vest, coat, belt, and other pirate accessories that would make Read proud. 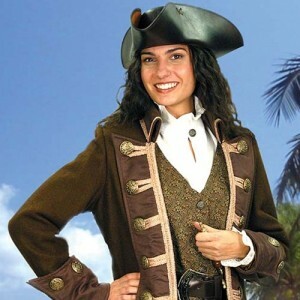 Don’t let the boys have all the fun – get your Mary Read costume from PearsonsRenaissanceShoppe.com today! The woman in the picture looks a lot like me. I looked up Mary Read because my husband and I are going to attend The Pirate Festival in Eastport Maine and we are going to drive an antique car, as well. I plan to dress up like she is, and my husband agrees that she is very pretty. This post was a great inspiration to me! !